It’s hard to express why I wanted to see Discovery make her final voyage, but I just had this feeling that I had to. A fascination and curiosity to see her in flight, without turning on a television or loading photos in my web browser. I’ve wanted to see a night launch for years, experience night becoming day. I’m told that you could read a book for ten minutes after, so much raw energy being expended from the solid-fuel rockets. There is something intense about breaking free of Earth’s gravity and how much fiery power is required to do so, and I can only imagine that forces of that magnitude can only be fully appreciated in person. My desire to see Discovery be ferried over Washington, D.C. is more of an emotional draw, the source of which I can’t explain. But the decision was simple, last Tuesday I took the day off and boarded the Metro, destined for the National Mall and eventually the Washington Monument. One man — wearing a NASA windbreaker — told me that it was a special day for him, having been to Discovery’s first launch and every one after. One amateur photographer — lugging around a rolling suitcase full of clothes and equipment — had driven down from Michigan the night before, just for the day, before planning to drive back that night. The press was on the scene as were dozens of families, milling around the base of the Washington Monument waiting to catch a glimpse. Sure enough, we could see the landing lights of the Shuttle Carrier Aircraft (SCA) shining in the distance, growing closer by the second. There was a tension in the air, then the cheers broke out. 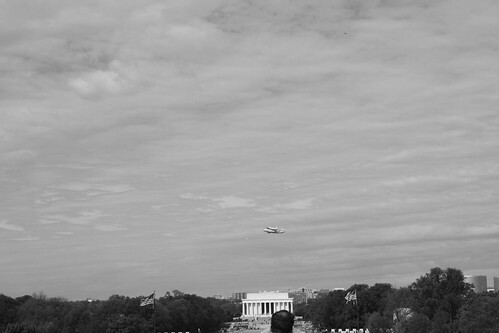 Even with nearby airports, it was surreal to see a 747 at that altitude, following the Potomac River but appearing to be aimed straight at the Washington Monument, much less with a space shuttle bolted onto the top. 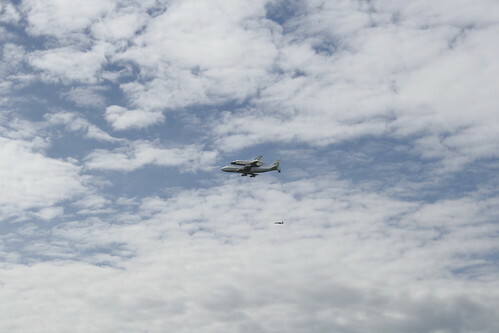 As she banked to the right and flew over the Lincoln Memorial we got our first view of Discovery’s profile and all we could hear was the crowd’s excitement and the rapid-fire clicking of cameras all around. She was huge, making the even more enormous 747 (for which I have a sense of scale) look like a toy and the T-38 chase plane look like a bug. In most of the photos I took the T-38 Talon is reduced to a handful of pixels, despite being 46 feet long. Even at an altitude of 1,500 feet I could see that Discovery’s skin was far from pristine, her tiles grayish instead of black, the result of many missions into space. I’ve read that the Smithsonian intends to keep her exterior as-is, scuffs and bruises intact. This pleases me. She banked to the left as she flew over the Marine Corps War Memorial, taking an amazing 45 minutes to make several large counter-clockwise passes around the National Mall, over us, the Capital, and the Department of Commerce. In what I normally find to be a beautiful but self-centered city, I found dozens of strangers talking to each other about their memories of the Shuttle program, smiles abound. Small kids were perched atop their parent’s shoulders. 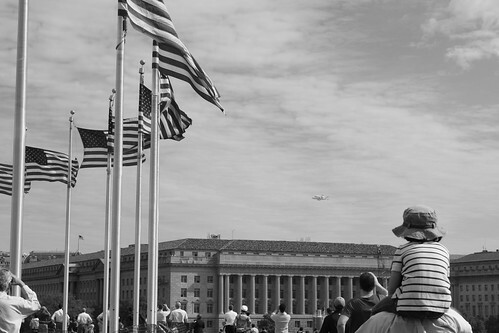 Adults were madly dashing around the Washington Monument to follow the aircraft, just like small children would. It’s amazing to see an event bring people together from all walks of life. I didn’t have the greatest camera gear along, my lenses are a little short to get anything super-detailed, so I opted for composition and creativity. CNET picked up one of them all the same, which is a pretty cool thing by itself. I shot a few hundred pictures, many of which I plan to turn into a flip book; the cloud cover might have been a downside for some, but for animation purposes it will help create the sense of motion. Are there better shots that captured the event? Sure. But that’s not as important to me. I was there. I felt the cool spring breeze on my skin. I heard the high pitched whine of the engines as the shuttle arced across the sky, framed between green grass, cloudy blue skies, and national monuments in between. I felt the excitement of the crowd, heard their cheers, and saw their smiles. Black and white photographs? Really? JJT: Unfortunately, yes. Didn’t check my settings before starting, didn’t realize till after the first pass.